President Nicolas Maduro, of Venezuela. 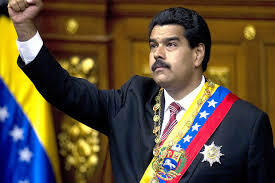 I am the mighty leader of the Venezuelan state. The name of “Nick Maduro” carries lots and lots of weight. And get them all deported at my grandiose command. Preparing to invade us with your doctrines and great stealth. We are Castro-centric till the end of our born days! If they disobey me I will beat them with maracas. In my barrio bajo I am honored with sweet song!